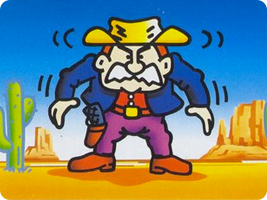 Wild Gunman was one of Nintendo's first 16mm film projector games in the arcades. Stock footage of a cowboy would approach, and when his eyes flashed you had to shoot him quickly before he shot back. This simple gameplay was carried over into the cartoony NES game of the same name. It was the first title to use the Famicom Light Gun (NES Zapper) in Japan, and was a launch title in the U.S.